Thank you for your inquiry, Eddie, and congratulations to you and your wife on the new baby! As for whether or not you can use your public water supply to dilute your child’s formula, that all depends on the amount of fluoride that your water treatment plant adds to the water it distributes. We have read that the Center for Disease Control (CDC) has issued a recommendation against using undiluted water sources that contain fluoride concentrations at or above 0.7 mg/L (ppm) to make formula for infants 6 months of age or younger. While fluoride does play a role in the development of healthy of a child, too much of a good thing can cause problems… like a condition known as ‘mild dental fluorosis’. Experts in the field describe dental fluorosis as visible changes to the enamel surface of the teeth. Very mild and mild forms of dental fluorosis — Teeth have scattered white flecks, occasional white spots, frosty edges, or fine, lacy chalk-like lines. These changes are barely noticeable and difficult to see except by a dental health care professional. At this time the CDC states that symptoms of dental fluorosis develop only in the teeth of children 8 years old and younger and only before the teeth emerge through the gumline. Why does dental fluorosis affect young children? Scientists and health experts hypothesize that since a child drinks a lot more fluids (formula & water) when younger and smaller in size, the amount of fluoride they take in compared to their body mass puts their fluoride per pound level at a much higher concentration. Think of this this way: If you add 1 gallon of blue dye to 10 gallons of water then the water will turn a dark blue color. This represents a small child consuming ‘normal’ amounts of fluoride. Now add that same 1 gallon of blue dye to 50 gallons of water and the water turns a much lighter shade of blue. This represents an adult or adolescent consuming ‘normal’ amounts of fluoride. Opponents of public water fluoridation immediately jump up and scream, “Stop adding fluoride to the water supply!” While that sounds like a quick fix, the battle of fluoridation of municipal water supplies has gone on for a long time so we highly doubt that it will end anytime soon — which means some public water supplies will continue to contain fluoride. Therefore, the CDC suggests using low-fluoride water sources like bottled water when making formula bottles for infants. Check the labels on the bottled water, though, to make certain you use deionized, purified, demineralized, and/or distilled water. For those not in favor of using bottled water, and we know a lot of folks out there who absolutely despise bottled water, by the way, we have found that a quality reverse osmosis water filter will do an excellent job of lowering fluoride levels in drinking water. Certain undercounter and countertop water filters also do an excellent job of reducing fluoride levels in drinking water, but make sure the unit you select specifically states that it reduces fluoride levels. Not all undercounter and countertop water filters include a filter cartridge designed to reduce fluoride levels! For the sake of this article, and because it would make his/her inquiry make more sense, we will assume that Malli intended to ask for a method of testing for FLUORIDE levels in water. Regretfully we have not heard of any ‘new’ methods a person can use to detect fluoride levels in drinking water since we last addressed this topic. Therefore we will continue to suggest using a meter such as the eXact Micro 7+ Water Testing Meter that uses Fluoride (SPADNS) Reagent to detect fluoride levels in water as low as 0.1 ppm and as high as 1.1 ppm. One could also use the mail-in fluoride testing services of a company called National Testing Laboratories to determine how much, if any fluoride their drinking water contains. So, Malli, once you determine if your water contains fluoride, next you will need to decide if you wish to remove or reduce that fluoride level… assuming you have fluoride in your water to begin with. Removing/Reducing Fluoride Levels in Drinking Water? When it comes to finding an effective means of reducing fluoride levels in drinking water, thus far our ‘research’ always points us down the same path… towards reverse osmosis water filters. The unit you see on the right, the Pentek RO-3500, has gone through testing and gotten certified by NSF/ANSI to Standard 58 for the reduction of Pentavalent Arsenic, Barium, Cadmium, Copper, Hexavalent & Trivalent Chromium, Cyst, Fluoride, Lead, Nitrate/Nitrite, Radium 226/228, Selenium, TDS and Turbidity. Though definitely NOT the most expensive unit on the market, this filter has successfully passed third party testing, can produce nearly 8 gallons of crystal clear, filtered drinking water per day, and does so while reducing fluoride levels by more than 90%. You will never know exactly how much fluoride, iron, copper, manganese, chlorine, salt, or other unwanted contaminants your water contains until you perform the appropriate tests on your water. Then, and only then, will you have the ability to make an educated decision regarding water treatment options. Fluoride in Drinking Water Linked to Lower Intelligence? Just when we thought we had seen and heard the full run of attacks on the addition of fluoride to public water systems, we came across the results of a study that claims children exposed to fluoride wind up less intelligent than children not exposed to fluoride. Yes, you read that correctly. Fluoride causes stupidity… at least according to the results of the study discussed recently in a publication called ‘Environmental Health Perspectives’. Fluoride is added to 70% of the U.S. water supply. Kids who drink this water suffer from decreased cognitive function, according to research published in Environmental Health Perspectives, a publication of the National Institute of Environmental Health Sciences. The study followed 512 children between the ages 8 and 13, with varying degrees of fluoride exposure. One group lived in a Chinese village with high fluoride levels, and the other in a Chinese village with low fluoride levels. The scientists conducting the study even eliminated other variables that may have affected brain health, such as iodine deficiency and lead exposure. With these variables eliminated, researchers found that the number of intelligent children in the village with low fluoride levels was 350 percent higher than those in the high fluoride village. Even more disturbing, 15% of the highly fluoridated children scored low enough to indicate mental retardation, verses 6% in the other village. How can you determine if your tap water contains fluoride? Call your local water company and ask them for the current or previous year’s Water Quality Report. By law, they must either provide you with a copy of that document or give you the online location where you can download it. Testing for fluoride in drinking water? Unfortunately no dip-n-read test kits or basic ‘wet chemistry’ test kits exist for fluoride. We know of only one test kit available to the general public at this time that has the ability to test for fluoride in drinking water and does not require users to have a degree in chemistry to preform the testing. 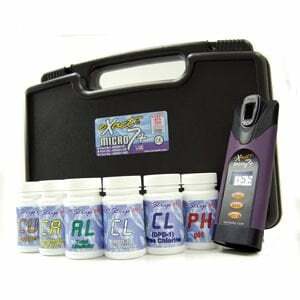 The eXact Micro 7+ Meter can test for fluoride levels between 0.1 and 1.1 mg/L (ppm) using time tested SPADNS chemistry. Do you need to know what that last bit means to use the kit? Nope. Yo will need to pick up the required fluoride reagentstrips separately for an additional $13, though, because they do not come with the basic meter kit. Fluoride From Tea and Toothpaste Weakens Bones? For those keeping tabs on the whole ‘fluoride overexposure’ issue, and especially those concerned about it, the following article ought to please you immensely. In a recent announcement, the United States Environmental Protection Agency stated that it had taken another look at the topic of fluoride exposure and determined that with all the other sources of fluoride in our surroundings, allowing traces of fluoride in the form of a commonly used pesticide (sulfuryl fluoride) no longer makes sense. So… if the EPA has admitted that it needs to reconsider its position on fluoride in drinking water, then perhaps we, as Americans, ought to wonder exactly how much fluoride our water contains, right? We think so. Ask your local water treatment facility for a copy of its annual Water Quality Report or for the web address where you can download a copy. Visit the EPA SafeWater Program Web Site for information on water quality in your area. Unfortunately the SPADNS chemistry required to perform fluoride testing in water does not lend itself to the development of a simple test strip or visual method… but that does not mean the average person cannot test for fluoride in their drinking water. 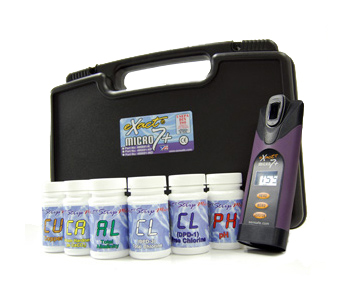 Over the past few months we have discussed the fact that a relatively inexpensive multiparameter water testing meter known as the eXact Micro 7+ has the ability to test for fluoride. 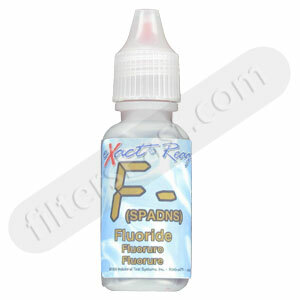 Fluoride Test Strips for eXact Micro 7+ Photometer required and sold separately (under $15 for 25 tests) on the FiltersFast.Com web site. For those who would like their water tested for fluoride by a certified water testing lab, we suggest taking a look at the National Testing Laboratories Fluoride Test Package. According to a study released in a recent online Osteoporosis International edition, fluoride in water plus fluoride from other common sources (tea & toothpaste) can result in serious damage to human bones called skeletal fluorosis. Sound ridiculous? It did to us as well until we took the time to think about the real point the researchers may have intended to make: We get exposed to potentially harmful compounds like fluoride all the time and from a number of sources we probably never even think about. In all honesty, we knew about fluoride in toothpaste and the drinking water, but brewed tea? Really? Apparently so. It does make sense, though, since boiling water reduces the amount of water in the kettle/pot — thus increasing the concentrations of certain contaminants (like fluoride and metals) in the remaining water. NEW YORK, Nov. 1, 2010 /PRNewswire-USNewswire/ — Fluoride consumption from tea and toothpaste damaged a woman’s bones, report researchers in Osteoporosis International published online October 9, 2010. Fluoride, added to water intending to reduce tooth decay, accumulates in and can weaken bones. To prevent bone damage or skeletal fluorosis, in 1986 EPA set 4mg/L as water fluoride’s maximum-contaminant-level. In 2006, the National Research Council reported that 4 mg/L is too high to protect health. Some brewed teas contain almost twice that concentration. This case describes a 53-year-old British woman with a broken bone in her foot and abnormally dense bones and badly decayed teeth. “A striking feature of our case was the very high serum, urine, nail and bone fluoride levels, to our knowledge the highest ever reported in a patient with [skeletal] fluorosis,” the research team writes. Her standard breakfast tea measured 7.6 mg/L fluoride. She drank six 8-ounce-cups daily, made with low-fluoride water (0.3 mg/L) and therefore 11 milligrams of fluoride daily. She brushed her teeth 8-10 times a day. “…it is not uncommon to swallow about 25% of the toothpaste applied to the brush,” report the researchers estimating their patient’s fluoride intake from toothbrushing at 4 mg/daily. This story reminded us of the man who developed an illness as a result of exposure to diacetyl, an additive used in flavoring for microwave popcorn. Why? Because the man ate an unreal number of bags on a daily basis; kind of like the way this woman drank 8 cups of brewed tea a day and brushed her teeth 8 to 10 times a day. We don’t know too many people who follow either of those people’s dietary and/or hygienic regimen but if we did, we’d probably suggest a few changes… and possibly some therapy. Having said that, though, the presence of fluoride in the water supply does make us wonder what amount the average person ingests on a daily basis. Why do they add fluoride to the water supply? Good question! The answer lies in fluoride’s ability to strengthen teeth and inhibit toot decay. Aside from that it serves no purpose — except, of course, to serve as the center of a raging debate where health officials have lined up on BOTH sides and each side has an arsenal of evidence to support its claims. Do all water systems add fluoride? And if so, how much? First of all, not all municipal water systems add fluoride to the water they distribute. Furthermore, the ones that do add different amounts depending upon things like water alkalinity and average water temperature. Suggested fluoride in water concentrations range between 0.5 mg/L and 1.2 mg/L since different organizations have different opinions on how much fluoride a water supply ought to contain. I have well water so I don’t have to worry about fluoride, right? Testing drinking water for fluoride? Although the eXact Micro 7+ Meter has the ability to test for fluoride levels as low as 0.1 mg/L and as high as 1.1 mg/L without the need for dilutions, most people will need to consult with a certified water testing laboratory such as National Testing Laboratories for assistance. Water filters that will remove fluoride from drinking water? While the experts may disagree on the benefits and health issues offered by fluoridated drinking water, the fact remains that lots of people do not want fluoride in their drinking water and want to know how to remove it and other potentially dangerous contaminants. The following information (text) comes from the About.Com Chemistry Section. Reverse Osmosis Filtration — This is used to purify several types of bottled water (not all), so some bottled waters are unfluoridated. Reverse osmosis systems are generally unaffordable for personal use. Activated Alumina Defluoridation Filter — These filters are used in locales where fluorosis is prevalent. They are relatively expensive (lowest price I saw was $30/filter) and require frequent replacement, but do offer an option for home water filtration. Distillation Filtration — There are commercially available distillation filters that can be purchased to remove fluoride from water. On a related note: When looking at bottled water, keep in mind that ‘distilled water’ does not imply that a product is suitable for drinking water and other undesirable impurities may be present. Brita, Pur, and most other filters — Some websites about fluoride removal state otherwise, but I checked the product descriptions on the companies’ websites to confirm that fluoride is left in the water. Boiling Water — This will concentrate the fluoride rather than reduce it. Freezing Water — Freezing water does not affect the concentration of fluoride. Before investing in a fluoride removal system, or any other water filtration system, you will want to have your water tested to see what contaminants your water contains. We always suggest using a certified water testing laboratory for this sort of thing but for those wishing to do water quality testing on their own, we suggest using a Water Testing Meter such as the eXact Micro 7+ which can test for many different critical water quality parameters and not just fluoride. Sorry, folks, but we just cannot help ourselves when it comes to posting articles pertaining to fluoride in drinking water. This topic has many people practically at each other’s throats in the scientific community and in communities just like yours all over the United States. The establishment media will have to find a new tactic with which to ridicule those who oppose the fluoridation of water after a major new Scientific American report concluded that “Scientific attitudes toward fluoridation may be starting to shift” as new evidence emerges of the poison’s link to disorders affecting teeth, bones, the brain and the thyroid gland, as well as lowering IQ. “Today almost 60 percent of the U.S. population drinks fluoridated water, including residents of 46 of the nation’s 50 largest cities,” reports Scientific American’s Dan Fagin. As always, if you fear the presence of fluoride or any other potential contaminant in your water, get your water tested by a certified water testing laboratory. Don’t take chances with your health. It’s your water, your health, and your life. Ineterested in learning more about fluoride filters and other fluoride removal systems? Fluoride in Drinking Water a Problem? Over the years we have read about various ‘horror stories’ where people suffered from acute allergic reactions to fluoride. Back in 1998 a member of our staff worked with a woman whose daughter received a fluoridation treatment at her dentist’s office accidentally (her chart cleary noted an allergic to fluoride) and the girl required immediate medical attention. While few and far between, one study indicates that approximately 1% of the population suffers from allergic reactions to fluoride, the dangers do still exist. Should most of the world fear the fluoride content of their water? Probably not. Given the likelihood of most people having an adverse to the addition of fluoride to their drinking water, if you still want to know if your tap water contains fluoride, get your water professionally tested. Then make a decision on water treatment options to remove fluoride — if necessary. Note: I said ‘professionally tested’ because to my knowledge, no reliable at-home test kit for fluoride exists. Most kits rely upon the use of more advanced chemical techniques and/or require a meter to read the results.